All that is left of La Casita as of ten o'clock in the morning on August 17, 2013. Substance photo by Kristine Mayle. LA CASITA IS NO MORE. By a little after ten o'clock in the morning, Board of Education contractors had leveled the library that had been created by the demands of a community that did not have one in a city where more than 150 of the public schools do not have libraries. 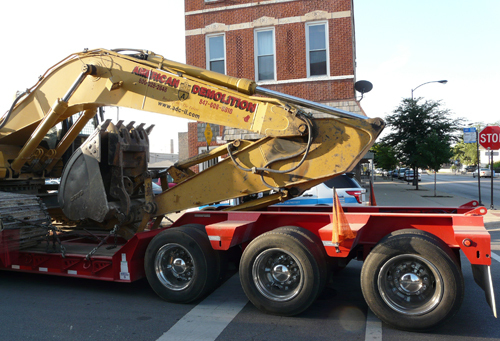 By 9:30 a.m. on August 17, 2013, contractors supposedly hired by Chicago Public Schools had begun using a back hoe to crunch away at the structure called "La Casita", the "Little House" located on the property of Chicago's Whittier Elementary School in the 1900 block of W. 23rd St. in Chicago. "If they were telling the truth about the asbestos danger that was the pretext for evacuating the building last night, then they are creating a danger for the entire community," a retired teacher who had witnessed asbestos removal at a Chicago high school decades ago told Substance. Demolition equipment arrives at La Casita shortly after sunrise on August 17, 2013. Substance photo by Kati Gilson.But as more than 40 protesters lined up to try and block the heavy equipment that had been brought in for the job, it appeared in mid-morning that the destruction of the building was going to move forward without regard for the health and safety of those in the community or the workers who were ordered to operate the equipment that was about to destroy the iconic building and ends its time as a symbol of community literacy and the desire for better education for the city's poorest children. Above, possibly the last photo of "La Casita," taken a little after nine in the morning on August 17, 2013. Within a couple of hours, Chicago Public Schools had reduced the building -- which had housed a community library and hosted community meetings as late as the night before -- to rubble. Substance photo by Kati Gilson.Meanwhile, police had pushed many of the protesters away from the La Casita building itself, locking most outside the school's gates. The result was that many people who wanted to try and block the equipment brought in to destroy the library that had been developed with popular support from across the country before a popular response could be mounted. By ten o'clock in the morning, the people at the site were calling and texting widely asking as many of their friends and acquaintances as possible to get to the site to protect the building before CPS officials had it destroyed. Construction workers who were manning the equipment had not been told that the building had been evacuated the night before, supposedly because of "asbestos" contamination. In fact, that was the official CPS explanation for the supposed emergency. 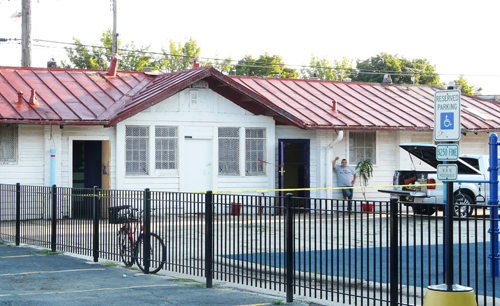 The original demolition order showed to the public and police on the night of August 16, 2013 showed that the "fieldhouse" site at 1900 W. 23rd St. in Chicago was to be demolished because of "Friable and Non-Friable" -- meaning asbestos contamination. The "Notification Form" clearly indicated an asbestos problem. By the time CPS officials brought in the demolition crews behind a police phalanx on August 17, CPS Chief of Security Jadine Chou neglected to tell local citizens, the contractors, or police that the site was toxic. Asbestos removal has strict requirements to protect the safety of both workers and others in the area. Substance photo of the order by John Kugler.In a communication with the local alderman, Danny Solis, CPS Communications chief Becky Carroll had told the local elected official that the reasons CPS was moving to evacuate the building on the night of August 16 were: the building had dangerous asbestos and that the roof was weak. SOLIS SUPPOSEDLY WROTE: Below is the info I've received from CPS regarding the Whittier Field House. I will join Whittier reps and CPS for a meeting tomorrow to address this issue. BACKGROUND: CPS has been in ongoing communication for nearly three years with the Whittier school community and the Whittier Parent Committee (WPC) to resolve the issues surrounding the Field House. CPS has had approximately 7 formal meetings with the WPC since fall 2010 to try and reach a resolution for Field House that keeps children and the community safe. In fall 2010, the WPC committed to providing the necessary repairs to the Field House, sign a $1 lease agreement in order to start that work and identify funds for those repairs. After multiple follow up meetings, in August 2012 CPS provided documentation to the WPC on how to bring the Field House up to safety code per its agreement with CPS. Since that time, the WPC has not taken any steps to bring the building up to code, raise funds needed for repairs or signed the $1 lease agreement. Perry and Associates, a licensed structural engineering firm has conducted three inspections of the Field House finding it to be in “a very advanced state of deterioration” and “not safe for occupancy”. They also found that the roof deck has “rotted all the way through” and “roofing shows evidence of delamination for the structure”. 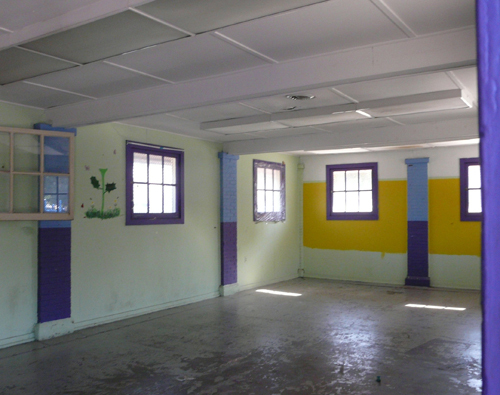 Above, the "unsafe" and "dangerous" main room at La Casita between the removal of stuff inside the building and the demolition on August 16 - 17 2013. Under four "Chief Executive Officers" (Ron Huberman, Terry Mazany, Jean-Claude Brizard, and Barbara Byrd Bennett) and two mayors (Richard M. Daley and Rahm Emanuel) CPS officials have tried to demolish La Casita rather than restoring it so that it could continue serving as the community center and children's library that the community demanded. On August 17, 2013, behind two or three false claims, CPS demolished the structure that had served the community for more than 100 years. Substance photo by Kati Gilson.On top of the building being deemed unsafe by licensed structural engineers, CPS has received multiple complaints from the community regarding the safety of the Field House. Based on the findings of Perry & Associates, multiple neighborhood complaints and clear visual evidence of deterioration, CPS has decided to move forward with demolishing the Field House and re-purposing the area at Whittier for a new playground, an artificial turf field and two basketball courts that can be utilized by all the students in the community safely. This work will be completed by December 2013. Currently, the Field House is utilized by members of the WPC, but the building has been deemed unsafe for occupancy. After the building was demolished, word spread among those who had been protesting that Alderman Solis and others would meet with them at Juarez High School, a mile to the east. Dozens of people went to Juarez to learn that, once again, Solis had misled them. By the time they returned to the site of La Casita in early afternoon, the contractor inside the perimeter was separating the valuable roofing material from the rest of the scrap that had been created in less than an hour after the back hoes moved in. "I'm saddened and angry that this has been done," said Kristine Mayle, who had arrived at the site around six o'clock Saturday morning. For years La Casita had been a safe, warm community libery for children." Mayle, who lives in the community, was elected Financial Secretary of the Chicago Teachers Union in June 2010 and was part of the protests against the closing of La Casita three months after she took office. A field house at a Near West Side elementary school that had been the site of a series of community protests over its proposed demolition was torn down Saturday morning. The single-story white building, known as La Casita to community residents, was located in the corner of a lot it shared with Whittier Elementary School at 1900 W. 23rdStreet. By about 10 a.m. Saturday, all that remained was a pile of rubble after the heavy equipment had done its work. On Saturday, police officers arrested 10 protesters, charging nine with criminal trespassing to state supported land and another with criminal damage to property. The building, which Chicago Public Schools officials say was unsafe and structurally unsound, had been the site of a sit-in that lasted more than a month in September and October of 2010, and there had been numerous discussions since then about what the building could be used for. The protests were re-invigorated overnight Friday and Saturday morning. This morning, about 70 chanting protestors carrying signs marched down Wolcott Avenue, the north-south street on the east side of the school, in hopes of securing a meeting with Ald. Danny Solis, whose ward includes the school. "This was something that was working for our kids, said Gema Gaete, an organizer for the group. "This was a safe haven." The programming held at the field house, including a parent-run library and student classes and activities, help keep kids out of trouble, said the protestors, who hope to get another building to take La Casita's place. Overnight, 13-year-old Angel Carrasco slept on her back outside the school on a parkway next to temporary chain link fences, keeping her and others from the small field house. She and a dozen or so others had gathered here to keep watch over the building overnight. Two marked police trucks – one SUV and one wagon – parked outside the miniature protest throughout the night. The building sat about 75 feet back from the fence, its lights on all night, and behind the fence was a taller temporary fence erected in about 20 minutes Friday night as protestors gathered nearby. As many as 70 people, including many kids, had been here earlier but the crowd dwindled throughout the night to a handful of community activists and the Carrasco family. Angel's mother, herself a former student at the elementary school in the Heart of Chicago neighborhood, had a 15-year-old just finish school here and a 10-year-old who is still enrolled. "We want them to stop the demolition of the field house," Delila Carrasco said. The field house served as the school's only library, one run by parents. The other half of the building was used for after-school activities, 15-year-old George Carrasco said. Alix Gonzalez, a 36-year-old CPS teacher at a nearby school, said she was protesting so community members – some of her colleagues and children of her friends – would have a voice in the process. "It used to be programming in both buildings," she said. "Isn't that what we need more of? Programming and schools to be open? That's how we're going to have less violence." "Among the District's top priorities is ensuring that our students have access to a safe and nurturing learning environment. The Field House at Whittier Elementary School has been deemed unsafe for occupancy over the last three years due to its advance state of deterioration and threat of the roof caving in. To protect the health and safety of our school community, CPS must take immediate action before students and staff return for the start of the school year on August 26. After the removal of this unsafe facility, CPS will replace it with a state of the art playground, artificial turf field and two basketball courts that students and members of the Whittier community can enjoy." Carroll also said that CPS has had 7 meetings with the Whittier Parent Committee regarding the building since the fall of 2010 and that an agreement to lease the building for a rent of $1 to the Whittier Parents Committee fell through when the parents group did not sign the agreement and did not make required repairs to the building. Today, the protestors at Whittier walked a few blocks northeast to Benito Juarez Community Academy, a local high school that was hosting a back-to-school event Saturday. The hope was that they would be able to meet there with Solis, who had earlier indicated on his Facebook page that there would be a meeting Saturday involving him, CPS and community representatives. This afternoon, Solis released a statement through a spokeswoman, who said that the alderman "was informed by CPS early this morning that the meeting with Whittier (representatives) had been cancelled." It was not clear who cancelled the meeting. Solis said he was told by CPS officials that the field house was "no longer safe for occupancy," requiring that it be torn down. "I am committed to working with CPS and the Whittier community to continue improvements at Whittier," Solis said in the statement, mentioning the playground and basketball court plans for the site. After failing to connected with someone from Solis's staff, the protestors headed back to Whittier, where they planned to hold a vigil for the field house about 4 p.m. Saturday afternoon. The activists put much of the blame on Solis, who they say could have haulted the demolition. "He needs to be held accountable," said Gaete. "Mr. Solis ... why are you hiding," some shouted outside the high school. "You demolished our field house and you are nowhere to be found." Some held signs that read "Alderman Solis you sold out your community" or "We need leaders who support our school." In an e-mail, a spokesman for Solis Saturday referred questions about Saturday's meeting to CPS. Raul Diaz, 13, said he was disappointed to learn that the shed where he played with friends had been destroyed. "We usually play around in there, hide and seek, tag you name it," the boy said. "Now we have to relocate." 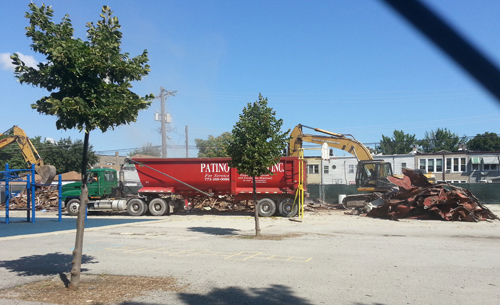 Whittier fieldhouse razed, protesters arrested BY KIM JANSSEN Staff Reporter August 17, 2013 (on line). Published in print edition August 18, 2013. 12:08AM on line. A Chicago Public Schools wrecking crew early Saturday morning finished the job it started Friday night — controversially and without warning razing a Pilsen school fieldhouse that was being used as a volunteer-run community center. Amid heated scenes at Whittier Elementary School, 10 protesters who’d camped out overnight in a failed attempt to save the run-down building were arrested when they tried to stop the demolition around 6 a.m.
CPS says the fieldhouse roof was dangerously close to collapse and that the building needed to be demolished in a hurry before teachers return to school Monday. It will be replaced with basketball courts, a soccer field and a new playground, they say. But protesters — who won a repreive for the building in 2010 with a 43-day long sit-in that attracted national media attention — accused CPS of an autocratic land-grab, comparing its actions to former Mayor Richard M. Daley’s own notorious 2003 late night, unnannounced bulldozing. “They pulled a Meigs Field in the dead of night,” said activist Gema Gaete, a member of the Whittier Parents Committee, which set up a library and has run English, dance and GED programs at the fieldhouse for several years. CPS insists asbestos removal crews actually went to work at about 6 p.m. Friday. CPS first tried to raze the building on safety grounds in 2010, but relented after parents and activists occupied the building for 43 days, saying their community desperately needed it to keep kids off the street. Former CPS CEO Ron Huberman offered the group a $1-a-year lease and offered to help it find the funds to renovate. But a dispute over the lease’s terms meant the parents group never signed it, and promises of TIF funding from Ald. Danny Solis and state Rep. Edward Acevedo (D-Chicago) fell short of the $1.2 million CPS says a fix would cost. That moment arrived Aug. 12, when structural engineers Perry and Associates noted further deterioration and found that “the building is not safe for occupancy.” Carroll said. With just a week before teachers returned for the new school year the demolition “needed to be done quickly” and there wasn’t time to consult with the parents group, she said. “They’ve had three years — they didn’t sign the lease,” Carroll added. Still, Carroll couldn’t point to any specific CPS warning that the building would be demolished since Huberman spared it in 2010. And documents provided by CPS to the Sun-Times show that Perry and Associates issued an almost identical report condemning the building as unsafe more than three months ago on May 5 — calling into question the rationale Carroll gave for the hurried destruction this weekend. Quizzed about the matter, CPS officials said they needed the second report to confirm what they had learned in May. Users of the community center said they arrived Friday night for a dance class and were shocked to be confronted by the bulldozers. 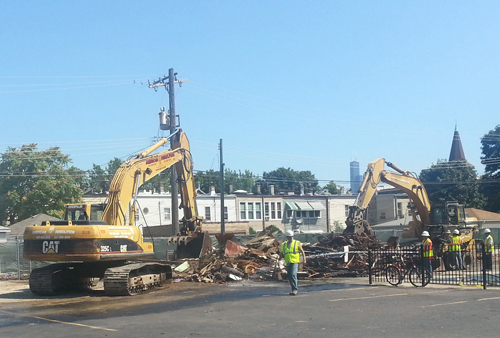 Kristine Mayle of the Chicago Teachers Union witnessed the wrecking crew finish its work Saturday. Chicago Police spokesman Veejay Zala said four women and five men were arrested for trespass when they tried to stop the demolition crew, and that a sixth man was arrested for criminal damage to a fence at the school. All were expected to be charged with misdemeanors. After the building was bulldozed there was dust everywhere. The water department was spraying water on it trying to settle it down. There were families with small children as well as teachers, community members, attorneys and construction workers breathing in this junk. Guess I need to add a face mask to my reporter kit. We need to buy our own bulldozer!!!! The Kroger food company built a bakery, warehouse, distribution center in the 1920’s, on the corner of 83rd and Vincennes. By the 1960’s it had become Simeon Vocational High School. One wing of the building housed the Machine, Welding, Auto Body, and Auto Mechanical shops. Under these shops was a basement/ cold storage area called the "Banana Room." It is hard to describe this exotic bit of real estate. Imagine an overhead track complete with rolling meat hooks going down one flight of stairs to a switching junction where swinging beef could be sent to one of five large cold lockers and retrieved the same way. Only the brave or dumb ventured into this relic of frozen produce. and we were told asbestos abatement would commence in the Banana Room. The contractor sent a spokesman to explain the procedure and tom the folks into believing all was well. He did a very good job of going over the procedure they were going to follow. The room was draped in plastic tarps. An airlock was set up, along with portable showers where the protected workers were decontaminated and their white suits placed in bags. All this went into covered, locked, dumpsters to be sent to special landfills. If the building wrecked today had asbestos and they just knocked it down, someone has created a serious public health situation. Asbestos is not removed with bulldozers. Part of my heart is in the dust at La Casita. I followed that struggle closely. I sent new books there, posted info on my site, felt such joy in the way the community held tight to this place and organized it for such good things. And now Rahm just figures they can go to his new DePaul sports facility instead. Core values of the Chicago machine are clear here. The demolition of La Casita was the physical embodiment of the coming 21st century agenda that started when Daley got elected as mayor (and continues with Emanuel): destroy the public schools. People who think saving the little house was about not liking change and holding on to a decades-old firetrap mistake the matter. The protests since 2010 were fueled by the prescient realization that those who rule will not look after local community interests, including cultural and historic significance. They had watched the African American parts of the community get railroaded by the District "for their own good" for years. The district recognizes that the economy of education is a corporate goldmine, but a corporation is NOT a person. The Whittier Moms knew that. People of the Whittier Public School community had held all sorts of cultural performances and workshops, tutorials, family and book readings, lessons, etc., inside. Friday, the last day, during the first threat of demolition, an Aztec dance was held. Funny that the District will get its way and "repurpose" the area, saying that ALL children will benefit, meaning from Cristo Rey, insisting that only Whittier families benefitted. Wasn't La Casita a "public" building? Didn't it benefit all that came? These administrations don't recognize the word! The Board and their demolition scabs believe that by tearing down La Casita, they'll erase the historic memory of the people, that they'll break down the will of the fighters, who would become tired of fighting City Hall and go away to other concerns. Their punctuation point to Saturday's action showed what they think of our families everywhere: La Casita, rickety second little home to Latino families, was worth so little to the Board of Education that THEY "re-purposed" an academic, cultural, community stronghold to be an extension of a vacant lot that everyone can use. That's what they think of us. This is unconscionable. Rahm Emmanuel has forgotten that he was elected to be a representative of the people, not a petty dictator bend on revenge. We unfortunately quit following the Whittier School library story, and the Chicago board of education decided to flex it's muscle. The support network collapsed for reasons that many readers of this well know, but that I am not going to mention here, as we need to rebound from this, and get up before the bell rings. This is not the 9th round. A year ago we were set to strike, and did. The Board and the powers that be have not gotten over that. Susan's words say it best however, and she is the resistance leader.